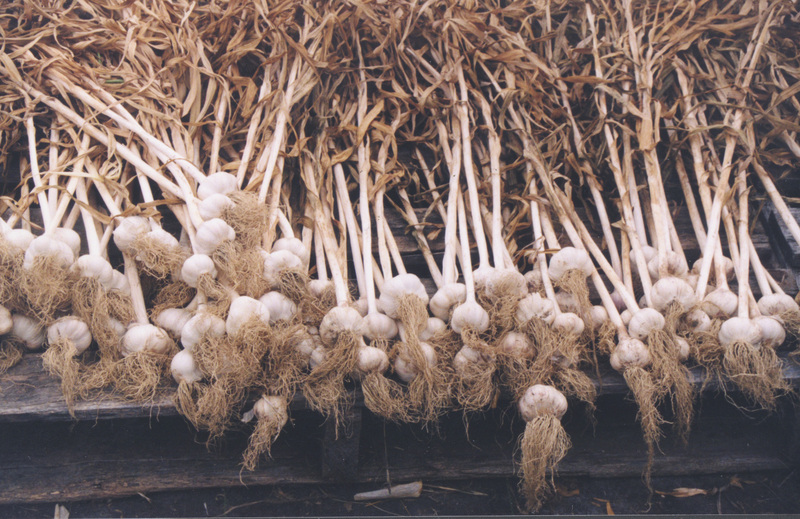 Garlic growers in MA begin thinking about harvesting garlic in mid-late July but timing the harvest can be tricky. Here are some tips to help you decide when the time is right. Heads should be left in the ground as long as possible to attain maximum bulb size (which doubles in the last stage of growth), but not so long that the cloves begin to separate, as these bulbs sell and store poorly. Harvest when leaves begin to turn yellow, but when about 60% are still green. Check bulbs by cutting through the head sideways to see how well developed the cloves are. Cloves should fill the wrappers - if they seem a little loose, the garlic has a little ways to grow. A little of the very outer wrapper may have started to discolor at this point. Harvest before the bulbs pop, which can happen relatively quickly, especially in a wet year. Remember that it is better to harvest too early than too late. Use hand tools to loosen soil under the bulbs or a mechanical harvester to undercut the bed. Pulling bulbs out when they are tight in the ground can open wounds at the stem- bulb junction and allow for fungal infections. Fresh bulbs bruise easily and these wounds can also encourage infection. Don’t knock off dirt by banging bulbs against boots, shovels, or buckets – shake or rub gently, and leave the rest to dry out during curing. Curing is important for successful bulb storage and finding the ideal conditions for curing can also be a challenge. Curing in the field runs the risk of sunscald, while poorly ventilated barns can result in loss from disease. Avoid high temperatures (over 90 F) and bright sunlight. Rapid curing can be achieved by placing bulbs roots up on 1” wire mesh in a hoophouse covered with a shade cloth, and with the sides and ends open. A well-ventilated barn will also work, but be sure that bulbs are hung with adequate air circulation or on open racks up off the floor. Curing takes 10-14 days. Stems may be cut before or after curing. Curing is complete when the outer skins are dry and crispy, the neck is constricted, and the center of the cut stem is hard. Storage. After curing, garlic can be kept in good condition for 1 to 2 months at ambient temperatures of 68 to 86 °F under low relative humidity, ie., < 75%. However, under these conditions, bulbs will eventually become soft, spongy and shriveled due to water loss. For long-term storage, garlic is best maintained at temperatures of 30 to 32 °F with low RH (60 to 70%). Good airflow throughout storage containers is necessary to prevent any moisture accumulation. Under these conditions, well-cured garlic can be stored for 6-7 months. Storage at higher temperatures (60 °F) may be adequate for the short term, but it is important to select a place with low relative humidity and good air flow. As with onions, relative humidity needs to be lower than for most vegetables because high humidity causes root and mold growth; on the other hand, if it is too dry the bulbs will dry out. Seed. Garlic bulbs that are to be used as seed for fall planting of next years’ crop should be stored at 50 °F and at relative humidity of 65-70%. Garlic cloves break dormancy most rapidly between 40 to 50 °F, hence prolonged storage at this temperature range should be avoided. Storage of planting stock at temperatures below 40 °F results in rough bulbs, side-shoot sprouting (witches-brooms) and early maturity, while storage above 65 °F results in delayed sprouting and late maturity. Garlic cloves used for seed should be of the highest quality, with no disease infections, as these can be spread to new fields and to next years’ crop. Be on the lookout for garlic blight nematode which may have been distributed around New England on infested seed garlic. This nematode, which is also known as a bulb and stem nematode, causes bloated, twisted, swollen leaves, and distorted and cracked bulbs with dark rings. Infestation with this nematode can weaken plants, causing them to be susceptible to secondary infections. The UMass Plant Disease Diagnostic Lab can make a positive identification; call 413-545-3209 to submit a sample. -R Hazzard. Resources: New England Vegetable Mgt Guide, Oregon State, ATTRA, Wishingstone Farm, Astarte Farm, USDA Handbook 66.